This 8,611-square-foot, painted concrete house is on a 0.40-acre lot on a ridge in Bryanston, a suburb of Johannesburg in Gauteng Province. The four-bedroom, four-bath house, built in 2014, has treetop views and limited vistas of the downtown skyline of Sandton, a business hub nearby, from the second floor. A long driveway leads to the parking court in front of the main entrance, said Lynda Greeff, a saleswoman with Pam Golding Properties Gauteng, which has the listing. There is a two-car garage on either side of the staircase to this entrance. The house, which is in a gated community, has an open layout and a double-height foyer. To the left of the foyer is a quarter-turn staircase with stainless-steel railings and an alcove leading to a guest suite with a balcony and an en-suite bath. To the right is a study with sliding glass doors that open to the yard. There are floor-to-ceiling glass walls throughout the house. In the living and dining areas, which are separated by a gas fireplace, the walls stack back and can be opened to the lawn and a solar-heated pool at the center of this walled property. The kitchen has glossy laminate cabinetry, Caesarstone counters, a center island with room for stools and a Smeg cooktop and stove; it is connected to a pantry and a laundry room. Upstairs, a central den opens to the master suite and two bedrooms, all of which are carpeted. The master bedroom has a gas fireplace; a separate dressing room with built-in cabinetry; a balcony overlooking the yard and pool; and a bathroom with a double vanity, a spa tub and an oversized shower. The other two bedrooms also have built-in cabinetry, balconies and en-suite baths. There are wall-mounted air-conditioners throughout the house. The garage level includes a wine cellar and access to both garages. There is another outside entrance to a separate bedroom and full bath, Ms. Greeff said. 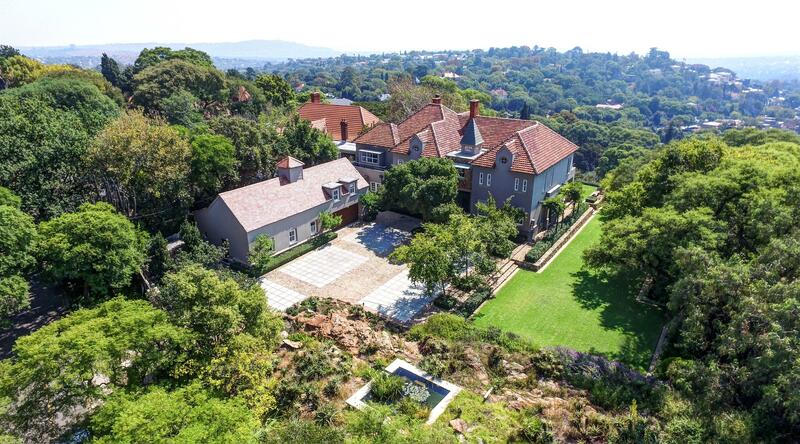 Bryanston, a diverse and affluent suburb, has about 29,000 residents, as well as “excellent private schools and some amazing shopping centers,” said Francois Rohlandt, a property consultant for Pam Golding Properties Gauteng who shares the listing with Ms. Greeff. This house is about six miles from the Sandton business district and five minutes from supermarkets, pharmacies, boutiques and restaurants. Central Johannesburg is about 14 miles away, or about a 30-minute drive, and O.R. Tambo International Airport is about a 35-minute drive. In recent years, South Africa has been weathering not only concerns about political corruption but also currency devaluation and a rocky economy. And those difficulties have adversely affected local residential real estate markets, particularly in the last 18 months, said Rupert Finnemore, the regional head of Pam Golding Properties in Gauteng. The problems aren’t entirely recent either, said Lew Geffen, the chairman of Lew Geffen Sotheby’s International Realty: “The Johannesburg market has been a roller coaster since 2012.” When the 2008 global recession began to ease five years ago, he said, the property market was buoyant, but that did not last. A number of new commercial buildings and high-rise condominiums are being built, he said, with new development fetching 30 percent more than resales of existing properties. And more inventory is coming on the market “at the correct price level,” Mr. Geffen said, so it’s easier to sell. But at the high end of the market, he added, people are still cautious about taking on properties that will be costly to maintain. Buyers from Africa – Nigeria, Angola, Ghana, Uganda, Gabon, Kenya, Zimbabwe, Congo and Mozambique — make up “an increasing proportion” of foreigners buying in the Johannesburg metropolitan area, Mr. Finnemore said. There has also been an increase in buyers from China and India, Mr. Ennik said. Those from Britain, Germany and the Netherlands, he added, typically work for multinational companies in the area. But as Mr. Geffen noted, the “percentage of foreign second-home purchases is so small as to be statistically irrelevant in Johannesburg,” which has mostly primary residences and investor and corporate properties. However, the maximum financing available to nonpermanent residents is 50 percent, Mr. Ennik said. Lawyers who specialize in property transfer are selected by the seller but represent both parties.